This week, I need to force myself back into the Hugo pile. The biggest disappointment about the Puppy nominees I’ve read thus far is that the stories aren’t nearly as offensive as their detractors make them (the Puppies, that is) out to be. With all of the accusations of sexist misogyny, I would at least hope to see some of the dated hallmarks of the sci-fi classics I’ve been enjoying recently. For all of the outrage, very little I’ve seen has been outrageous, or even particularly provocative. Where is the sci-fi Salome I was promised? The mild and inoffensive nature of the Puppy entries is in bizarre contrast to those who’ve given me the impression that it was all going to be Spacemen doing manly things, like shooting guns and absconding with inappropriately dressed women on implausible worlds of mushroom forests populated by spear-chucking natives. I mean, if everyone is calling you racist and sexist, at least have some fun with it! I know I really need to get back to doing my Short Reviews series, and probably will once my Holmes/Moldvay game is underway and on track. Real men smoke cigarettes in outer space. 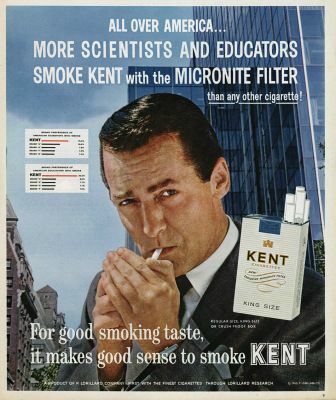 And when they do, they smoke Kents. *: feel free to guess which multiple Hugo winning, Hugo Winning, and Hugo Nominated authors wrote these great tales! This entry was posted in Books and tagged awards, Books, Kent Cigarettes, sci-fi. Bookmark the permalink. Also, it’s weird, because this has been one of the few times I’ve been really conscious of the effectiveness of advertising on myself. I hate cigarettes and smoke just closes up my lungs and sinuses like a vice, but damn if I’m not compelled to support a brand that supports great science fiction! And yeah, I failed to mention in my earlier post, the Vardda are all smoking cigarettes on their space ship. There’s a very complicated explanation as to why and how they can move faster than light without their cell structures collapsing, but lighting up? No problem! I’m going to discuss the controversy *once* after I finish reading everything, because I actually care more about the books than the people writing them and their internecine squabble. From much of what’s been said it’s obvious that isn’t true of many of the puppies’ critics (and they can’t really blame having not yet read the packet because they obviously didn’t read (or choose to misrepresent) Correia’s Grimnoir series). I’d be interested in hearing your perspective on it, for sure. Ms Marvel has been my favorite nominee I’ve read this year, and even that felt somewhat lacking. The only thing I’ve read, though, that I actually hated was the Day the World Turned Upsidedown (or whatever it was called), which had almost got blocked by the slate. So, it’s hard to say that what would’ve gotten on had the slates not dominated would’ve been any better or worse. Not seeing a full breakdown of nominating votes, I’ll probably never know. But I’m reading Vance’s Dragon Masters right now, and I don’t think even if I squinted my eyes really hard, I’d find anything comparable to that this year, but if you see something, let me know! An interesting piece of history. I went into this Puppy stuff later than most people, but what I have seen seems to agree with what you wrote here. The thing that got me into the Puppies was Jeffro; once upon a time, Cirsova was almost purely a gaming blog, and I’d been a fan of his gaming content since about as long as I’d been blogging. It was incredibly exciting that someone from the gaming community, particularly the OSR, was getting recognized for their work outside of the game-blogosphere. All the talk about a revolution in science fiction didn’t quite jibe, though, with a lot of their picks. It was kind of like the time my punk band got feted and sworn into an edgy Heavy Metal club (we didn’t even have to go through a probation period! ), but it turned out most of them liked stuff like Nickelback and when we played shows, a lot of them were genuinely scared of us.